When a bunch of Chennai Runners were talking about running the 2014 Chicago Marathon, I didn't give it a serious consideration. I have run it in 2010 and there was no business travel in the horizon, so why bother was my thinking. 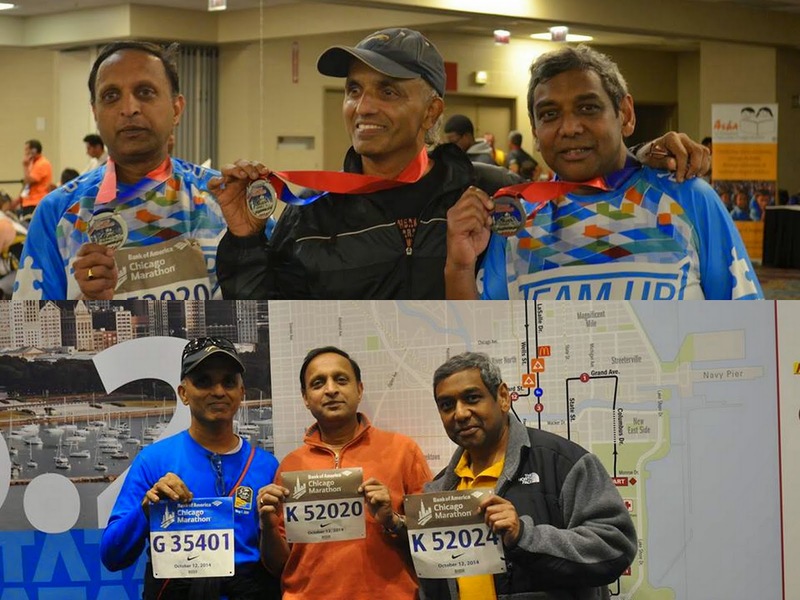 But, when my college friend now in US casually mentioned about running Chicago for charity, I pulled two other college friends (and first time marathoners) made a pact that four amigos would run Chicago. Even after the Amigo pact, I wasn't in two minds and to make it harder, I said to myself, 'would go only if I win the lottery'. So, I entered the lottery and was hoping wouldn't get thru but as luck would have won it. After that, I had no other escape routes and committed myself..
Four Amigos got to three as the Mumbai amigo couldn't make it. The guy to my right in the top is Laks and pretty much has the entire alphabet soup after his name. Prasad, to my right is doing some high funda research in MRI and one day would get that famous early morning call from Stockholm. Of the three, I am the least 'qualified' but coming to think of it, it was written in big bold letters even during our college days but then I was oblivious to it then, like now. But, this illiterate is quite happy to have gotten the two academic elites to take running and enjoy it. To be candid, I was little worried about Laks. He kept talking about his lack of preparation and I wondered if I had done the right thing by getting him to sign up for the big thing. What I had forgotten was that he is like Dr. Ram Rajagopalan and works smarter and not harder. Laks surprised me once again to have finished comfortably with juice to spare. I keep asking him to teach me that trick and he has been trying for 30 years. I am yet to learn and it is a surprise that he hasn't given up on me yet. I was little bit more comfortable with Prasad as he is local and has run the same course last year. He also comfortably finished the race. Laks & Prasad - I am proud of you guys.. but then we go to do it again, don't we? This doesn't count as Srini couldn't join us. Let us ensure we do this again as Four Amigos... Do I hear Big Apple calling?